All the staff at L&E engaged with our son and brought him out of his shell to enable him to become an independent, confident young man with a curiosity and interest in other cultures. Thank you, L&E. We’ve worked very hard to keep the prices the same as last year. The only small increases we’ve made have been to the “extras” to reflect our external provider’s increases. Until 1st November we are able to offer all next year’s programmes at special discounted prices. Not sure of dates!? Don’t worry…we can be flexible! The rain graced us with its presence on Saturday and set the mood for some sad goodbyes to some of our week one campers. As the campers chatted, there were many email addresses and phone numbers swapped, as well as plans made for reuniting at next year’s camps. The remaining campers were excited to roam the street of the iconic city, York. The visited cultural sights, and did a lot of shopping! Some even managed to get into the new Harry Potter shop. In the evening, they enjoyed watching the movie, ‘Mohana’, and sang along to the soundtrack in the performing arts hall. Saturday soon turned to Sunday and it was time to welcome some new campers to the groups on Aysgarth School. As the arrivals came into the dining room, they were welcomed with open arms and encouraged to gorge on a fantastic BBQ and then teamed up in a few wide games, organised by the world class L&E tutors. With bellies, warm with hot chocolate, and new friendships beginning it was time to go to bed to get some rest for L&E North Camp, Week Two, 2017! The sun was shining and it looked like it would be another beautiful day at L&E North camp. The new campers were all settling in well with the help of the veterans from the week before. With a hearty breakfast behind them, everyone was excited to get stuck into the activities for the week ahead. After a quick dodgeball warm up, where some of the tutors became a little too competitive, the campers choose they’re activities. The trip to Aysgarth falls proved very popular and the pictures taken showed it to be a triumph. Some real sporting talent was shown during basketball, with a game of killer managing to continue for 45 minutes. A benchball finale topped off the morning sporting session in the beautiful weather. In Creative the campers origami skills were put to the test. It was lovely to see many of the confident campers sharing their skills with their new found friends. Adventure topped off the morning with den building where some impressive structures were made. The afternoon brought the chance to see some of the new footballing talent on camp. Some impressive skills were on display and plenty of goals were scored. 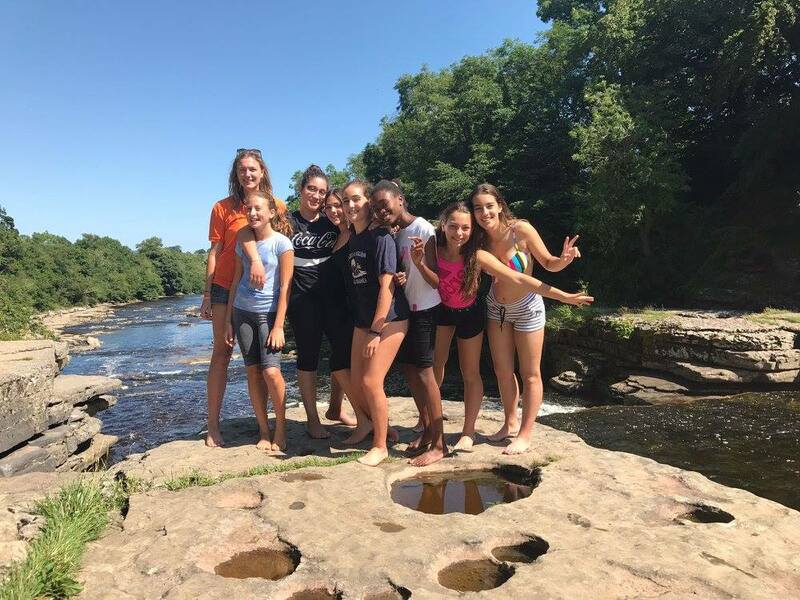 Another fantastic trip to Aysgarth falls was again a huge success. Musical theatre made up the creative option with some wonderful renditions of Mary Poppins and Matilda. After a substantial dinner it was time for Ice breaker games. With water, balloons, flour and Malteesers the whole affair was rather messy. However, all the campers were getting along swimmingly. As the weather was so fantastic, the day was topped off with a session on the water slide. After showers and hot chocolate, everyone went to bed. Tired, yet still smiling. It looks like it’s going to be another fantastic week at L&E North camp. The radiant sun lofted into the sky, bringing us another glorious day here at L&E. The children kicked off with the famous traditional morning dodgeball. Where courage, honour and some physics defying throws were made by many of the children. Once the dodgeball dust had settled the children were split up into their morning activities, the “children of the water”, had the option of scuba diving as an extreme adventure activity, with our instructor Scuba Steve (Note, his name is not Steve). The sports option for the morning was volleyball, as the campers ran over to the net with massive smiles plastered to their faces, and all the energy of a wind up toy. The tutors stood in the background deciding the best way to tell them that they could not find the ball. However, a dodgeball was enough to get the game going! Amazing talent was shown from both sides, however, one of the tutors being hit in the face was the highlight of the volleyball. Later that morning, the campers were once again split up into teams, as they were about to face off in the L&E rounders tournament! With warm batting arms the teams took the field with victory in their eyes. It is an event that will continue throughout the week, however the competition is intense! The creative squad had a full day of baking! In the morning they planned their three course meals: cake followed by pancakes and for desert, cupcakes. Then in the afternoon the campers got their hands dirty working away at their projects. However, outside in the sunshine another group of creative campers were making tea stained paper! the atmosphere was so cheerful, as they dabbed wet tea bags on paper to give them an old vintage look. Just over the road, a mini Wimbledon was taking place where amazing tennis skills, rallies and games were being played! The tutors took on some of the children but were no match! The afternoon ended with a massive water fight. What a way to end the perfect sunny afternoon. The plan was to start with some games, and you can imagine how long that lasted. The first cup of water was thrown and carnage descended upon the innocent games. Water flying everywhere, water cannons, cups, water balloons, and many more pieces of watery weaponry were used in this glorious battle. As the cold breeze rolled in the campers sealed refuge in the warm pool. To end what has been another astounding day at L&E, the campers made their way to the camp fire, where songs were sung, friends were made and the tutors made fools of themselves singing one direction. The warmth of the fire roasting the children marshmallows to perfection. After a quick goodnight from the tutors the campers fell asleep. The morning started off with a typical English breakfast of bacon and baked beans. We all then headed off for the morning wake up which is dodgeball. The camp played a few games between themselves to prepare them for the big campers vs tutors, which as always, the campers won. The morning activities were building marshmallow and spaghetti bridges in creative, touch rugby in sports and the morning adventure group headed off to canoeing. Sadly today wasn’t one of those typically warm summer days. So the canoeists took some warm clothes for when they got out the water. The sporty campers took on touch rugby, which had them running around, doing planned moves in no time. In creative the campers choose to eat most of the marshmallows, instead of using them as building blocks. Faye and Greta replicated the London Eye with their amazing marshmallow and spaghetti replica. The football team had an intense training session with resident coaches Sam and Baptiste, followed by a good match. The creative campers made pom pom accessories which could go in there hair. The night ended with a light hearted comedy, the Pink Panther, which they all enjoyed. Lets keep our finger crossed for some hot sunny weather tomorrow! After waking up bright and early, the campers feasted on baked beans and eggy bread for their breakfast. Something new relished by all, it set the camp in good stead for the day ahead. Even though the rain from the previous night had not abated, children and staff alike launched into the day undeterred. The morning’s adventurers went off in good spirits to do some climbing. Those in the English class enjoyed a morning consisting of the Hat game and story-telling, excellent practice of their language skills especially when it came to the spooky ones! Meanwhile, the sporty bunch worked up a sweat first with ultimate frisbee and then quick cricket, all in the safe vicinity of the sports hall. That just leaves our creative group, who tried their hands at both watercolour painting and boxcar making – all in preparation for the days grand finale, theme night! After breaking for a wholesome lunch of pasta Bolognese, we commenced the afternoon’s activities. The second group of climbers headed off and after their session it was noted how well they showed great grit and determination to battle through the elements on the rock face. Back at school, our creators first made their own microphones with which they rehearsed for the upcoming talent show – more on that later. The sportschildren tried something completely new: swimming pool volleyball! The children loved both the novelty and the opportunity to splash around in the pool. A brief pit-stop following where the campers fuelled up on pie and vegetables before dashing off to change into their outfits for theme night. The theme: British superstars. The first half of the evening saw the kids enjoy all manner of stands set up by some very special British people from past and present. They did archery with Robin Hood, the crossbar challenge with David Beckham, wildlife documentary making with David Attenborough and Charles Darwin, plasticine model making with Wallace and Gromit, and even high tea with the Queen and the Mad Hatter! We subsequently relocated to the theatre for the culmination of the evening’s events, the aforementioned talent show. The audience was awestruck by the wonderful singing, dancing, gymnastics, music, and magic put on show which ended up with the entire camp onstage dancing along to Beat It by Michael Jackson. Then followed hot chocolate and bed, with smiles firmly on campers’ faces. The children woke up to gloomy English skies, but this did not dampen the mood of our happy campers, as they rushed downstairs to be awoken with chocolate brioche for breakfast. We then initiated our favourite L&E tradition of dodgeball, with some of the children opting to do some relaxing Yoga instead. Dodgeball was very competitive, and some children adopted various roman military techniques using work-out mats in order to push their team to victory. Afterwards, the children went off to enjoy their morning activities, with the English students going to Masham to participate in some riverside walking and sweetshop browsing to get the true English immersion experience. The adventurers went into the forest to create some fires and cook some camp-made bread over the embers, which went down a treat with tutors and campers alike. The sporty campers had an intense game of handball to wake them up and get the adrenaline flowing for the afternoon activity, while the creative children went off to create some postcards and paint each others faces. After a stereotypically British lunch of fish and chips the children prepared for afternoon activity, the L&E Olympics. Adopting a comical stance, the event included numerous relay activities, such as egg and spoon racing, a particularly frantic fancy dress extravaganza, tennis and finally concluding with swimming. The events culminated in the renowned L&E Oscars ceremony, whereby the winners (Baptiste’s team!) were proudly announced. Alongside the announcements, we were fortunate enough to watch a gorgeous acrobatic display from some of our talented campers, as well as a scripted humorous piece from some of our older girls, the excitement in the room was certainly palpable. Having such a vast array of talent instilled within our campers is certainly one of the aspects that differentiates our camp from the rest. Concluding with our infamous hot chocolate, yet another gorgeous sunset cloaked a fabulous day.